There are a ton of great games nominated for Origins Awards this year. We're not just saying that because The Stars Are Right is smack-dab in the middle of the list for Best Card Game (although it is, and we'd be remiss if we didn't mention it). For instance, in a life previous to coming on-board with us, resident game developer Jonathan Leistiko designed The Isle of Dr. Necreaux for AEG, which is also in the Best Card Game category. And in the Board Game section, former Production Guy Justin DeWitt's Castle Panic has made the grade as well. But wait, there's more! 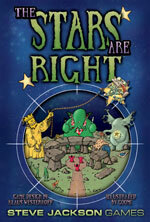 Scribe of the esoteric Kenneth Hite penned two nominees: The Day After Ragnarok and Cthulhu 101. Other nominees like Thunderstone, Endeavor, Small World, Ren Faire, Monsterpocalypse, and Warmachine have all been enjoyed here in the office. If you're attending Origins in June, you'll have the opportunity to vote on these and many other games. Look for the Origins Awards booth, and exercise your rights! If you're not attending Origins, read some reviews, talk to your friends, and vote with your dollars. Some will debate the relative merits of one game over the other, but the core idea here -- that these games are among the best in the hobby -- is rock solid. Chances are you'll find something on this list you'll like, and that you haven't heard of before. And that's what "best of" awards are all about.